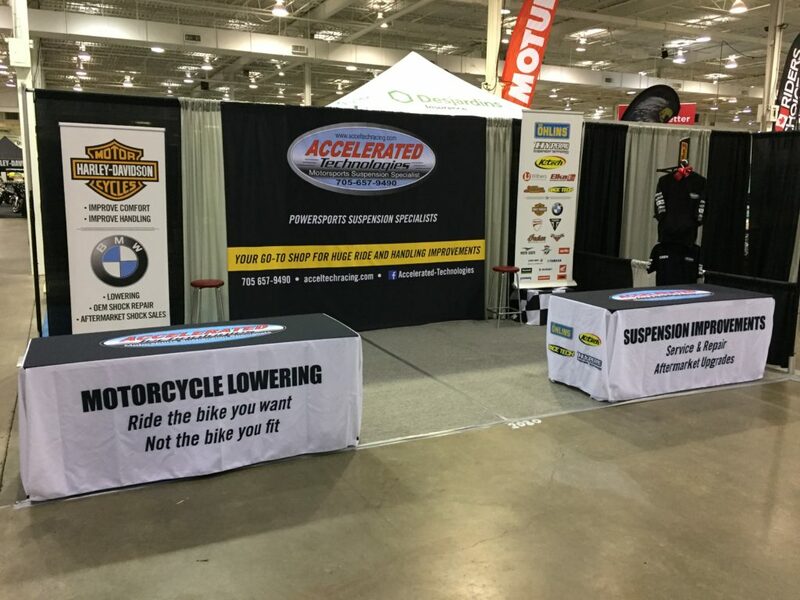 With the January bike shows behind us, we are now among the ‘glass half full’ crowd. Even though we haven’t pulled out of the winter snows, not by a long shot, spring is now officially closer than fall! I thought this month we would take up some column space and discuss working on the bike a bit. Instead of doing the usual ‘what should you do to your bike in the spring’ bit, I thought we would discuss the required tools and maybe some shop tips instead, for those that enjoy the satisfaction of tackling some jobs themselves. 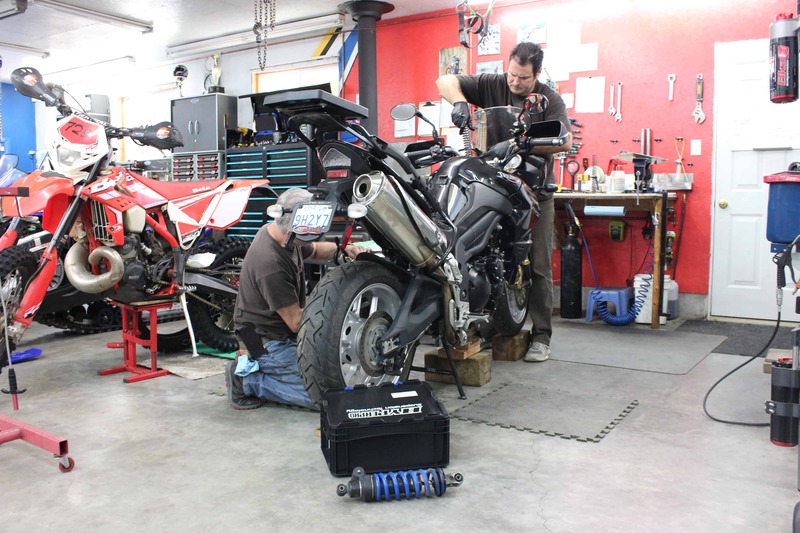 Let’s, first look at a check list of things you may need to properly maintain your own bike. The first thing you are going to find invaluable are a pair of bike stands. 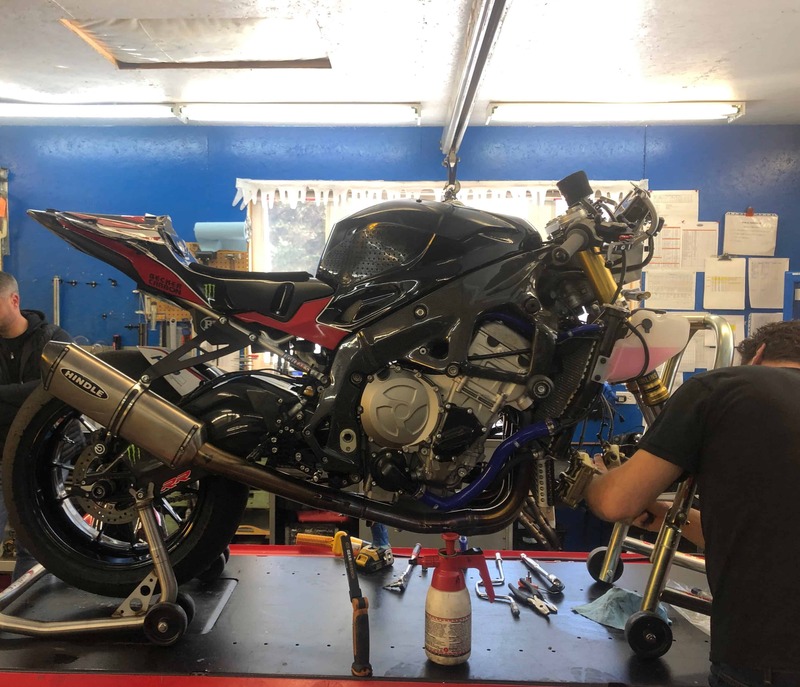 Stands not only get your front and rear tires off the ground, but they also hold the bike level, steady AND raise it up a few inches to make it a bit easier to work on. Larger sport touring bikes have centre stands that are usually balanced so that the rear tire is off the ground, so this will save you a purchase for the back of the bike, but most bikes aren’t so well equipped. Stands will last you a lifetime, so get good ones! Pit Bull and Hindle’s newer 4-wheel rear stands are my favourite out back, and we use only Pit Bull front stands for the front of the bikes in our shop. Avoid, if possible, the rear stands with the rubber ‘shelves’ that go under the swing arm. They are not very stable and the bike has a tendency of sliding down the stand and then falling over. The stands that require you to purchase some spools to spin into the mounting holes in the back bottom of the swingarm are the best. Most modern bikes have a mounting location for this purpose. Up front, your first option is a stand that goes under the bottom of each fork leg and lifts the tire off the ground. This permits rim cleaning and tire spinning chores like checking tire pressures, checking the tread. 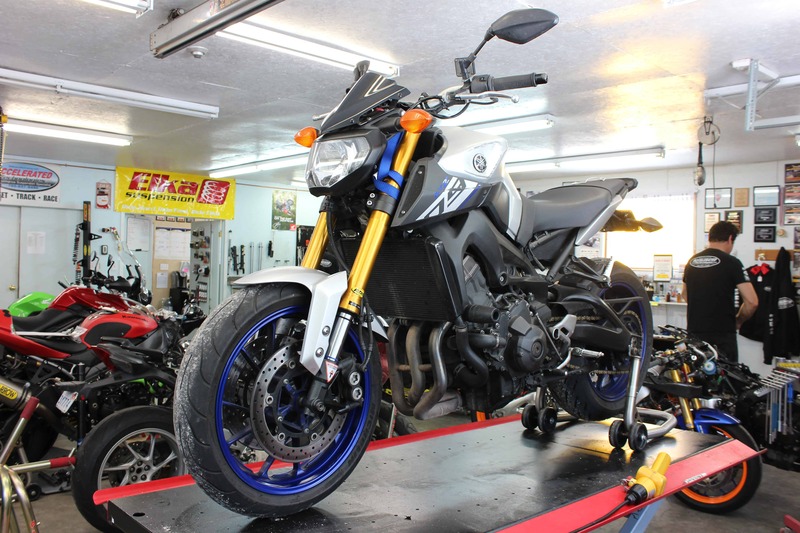 and brake pad inspection and service, but it doesn’t allow you to turn the bars at all, properly remove the front tire, or look at or remove the forks. So, depending on the job ahead, a complete front end stand that locates inside the steering stem is a better stand for most jobs. Now that you have the bike elevated and stable, I would shop for a good oil drain pan with an integrated pour spout, and an oil filter socket. These special sockets slide onto the end of your oil filter and adapt to a 3/8 drive ratchet to allow you to properly remove and torque your oil filter. Since we opened the tool discussion, lets jump in and look at a minimum tool kit that we need to do most simple tasks…. First, a socket and wrench set! Get a decent one, don’t buy it at the dollar store, go to Canadian Tire or to a specific tool store. You can get a great kit from CT if you watch for the sales to get the basics. Most imported bikes use 8,10,12, 14, 17 and 19mm for everything and most Metric kits will have that as a minimum. While getting the smaller sockets, you can purchase individual larger ones for your axles if you don’t want a whole expensive kit… Most front axle nuts are 19, 22 or 24mm and rear axle nuts are typically 27, 32 or 36mm. Most socket kits come with ratchets, but basically nuts and bolts up to 19mm use a 3/8” drive ratchet, and above 19mm will require a larger ½” ratchet. So, get one if your socket kit didn’t come with one. I see $10 digital verniers at Princess Auto all the time, I use a similar one about 10 times a day! You can use it to see what size nuts you have, then buy your sockets accordingly! In addition, you will need a good screwdriver set with 2-3 different sizes of regular slot ends and #1,#2, and, #3 Phillips ends, these will be invaluable as well for working on bodywork and handlebar controls. For the last 10+ years, bikes have favoured Allen headed fasteners more and more. The junior mechanic will be ok with just a set of Allen keys, using 2.5 up to 10mm, but as you spend more time in the garage, a set of Ball end Allen keys will be appreciated for the screws you can’t quite get straight onto. Then, when tiring of spinning the Allen key 20 times for each fairing screw you are removing, you will look to find them adapted to 3/8 drive sockets so you can spin them quicker. Intermediate mechanics will graduate to “T” handles for both 8-14mm sockets as well as Allen keys to give them speed and torque when working on non-critical fasteners. Motion Pro tools, available through any bike shop, have a great range of these type of bike specific tools for the technical enthusiast. While shopping for Allen keys, you can purchase a stepped set of 4 large Allen sockets in one for removing new style front axles that don’t use conventional nuts, but instead require a large Allen key. Domestic cruisers will need an imperial socket and wrench set, and BMW owners will find that they need a complete set of Torx bits in addition to everything mentioned above. Finally, a decent torque wrench or two will help you develop a feel for just how tight things should be. A range of 8 lbs/ft to about 80 lbs/ft will cover most applications that you will find on your bike. There, that covers most of the Hardware needed to get you into some serious trouble, now let’s look at the ‘software’. Contact cleaner, WD-40, and a Pledge like polishing spray are 3 excellent cleaners we use often. The smell of contact cleaner is overpowering, so we use it sporadically outdoors or for special circumstances when blasting a hard to reach, greasy spot. Otherwise we use a bulk degreaser sprayed with a manual pump. WD-40 we use to clean aluminum, wheels (not the rubber) and swing arms, where we find it is a brilliant cleaner, but as a lubricant, there are better products out there. Then Pledge, or our favourite, Honda Spray Cleaner and Polish is great on windscreens and fiberglass or ABS bodywork. A can of Corrosion spray and penetrating fluid are great to have when working on older bikes and a can of chain lube and another general clear spray lubricant are good for axles, pivots and controls. While discussing lubricants, a small bottle of Red and Blue Loctite graces every mechanics toolbox for reassembly. We use a variety of greases for different applications, but a good tube of general purpose or lithium grease will suffice when called for. We run to Costco for our Blue shop towels as we use them for most cleaning applications. Some big shops will have a rag recycling service for the tougher cloth rags, but you will find the blue ones are perfect for most jobs. This above list should definitely get you prepared to tackle most jobs yourself.